Around noon, (having been up since about 5 am) they boiled the kettle over an open fire, either thawed near the fire or ate cold the lunch they had, after cutting down as many trees as they could as they were usually paid "by the cord" or if they worked for a company sometimes by the month (beleive it or not some even got as much as $4.00 a month, some only $2.00 depending how good they were), after lunch they went back and worked til they could see no more when the sun went down.. And beleive it or not they came back to the camps, had supper which the cook made best he/she could with what they had for supplies and some of them still had enough energy to sit and play cards or tell a few ghost stories or joke. gheeeeee some even sang a few songs if one of the men had a harmonica in his back pocket. 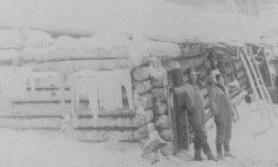 The logs they had cut all day were left where a few men could pick them up , "twitch" them by tying a chain to one end of the logs and hauling them with a horse, usually only one, to a yard where they were piled . From the yard they were measured, marked by a "scalor" and taken to the nearest river or head of a "sloose" with a "bob-sled" and a team of horses. A "sloose" was a long tall craddle-like apparatus which was built when there was a high bank before getting to the river. the wood would be dropped in the "sloose" and it would slide down to the river below. 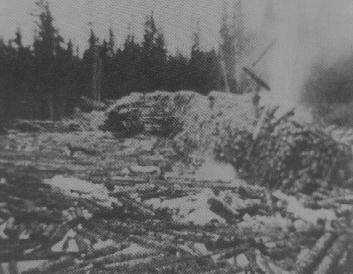 The river carried the logs downstream to some "Booms" that were built just for the purpose of grabbing the logs on their way down. 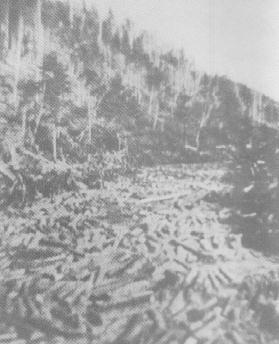 But at times it wasnt that easy, the logs would get caught on banks, the river got narrower and logs would get caught in "jams" , many men lost their lives and limbs to "log jams" my father's two cousins were some of them I remember. There is a song, written by Wilf Carter, about one of them (The Legend of Johnny Doyle) who lost his life in such a "jam" in Ontario on my web page in the "Doyle" family. These men who went and broke up the "jams" had to be experts, they had to walk out on the logs which after all were afloat without falling in as getting out of there was also a matter of seconds to save your life thing. Most of the time, they had to go to a certain spot in the "jam", and they had to know exactly where, if they didnt set it just right it wouldnt work and they had to start all over again , they would set up some dynamite, light the fuse, and run on those wet logs back to safety. And we think we have it rough:). You also have to remember now that these logs were not only transported a few miles by the roaring river, most of the time, these men who followed the logs "worked the drive" were on the river banks walking and sleeping over for weeks..Someone would bring the food, they would build little holes in the ground or most of the time snow, as this was usually done first thing in the spring, they would build these huts with poles and branches they cut at the scene. 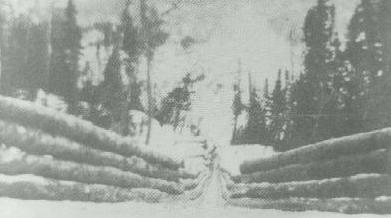 When the logs would reach the "booms" (this is where the name Boom house Road came from in Atholville NB, next to where the "Old Athol House Cemetery" is situated, and the "booms" are still there today) at last, the "booms" which were long lines of tied together wood to catch the logs would be closed and made into a circle and pulled down the river to the mills with a "tug" boat. Some times depending on the area, the men who "ran the drive" were not the same lumberjacks who had cut the wood, sometimes they were.